Delivery service Flowers.ua provides free delivery fee of flowers to Lugansk. Order flowers with delivery to Lugansk through our site and bring your loved, colleagues or partners unforgettable impression! For making order for flowers to Lugansk you can use our catalog, or contact us by phone or . Send flowers to Lugansk can be completed with a beautiful soft toy or a box of chocolates. Flowers in Lugansk also can be accompanied by a free postcard. Making order for flowers in Lugansk will take several minutes. Buy flowers in Lugansk on our site quickly and easily. Florists of flowers internet-shop Flowers.ua able to collect floral arrangement at your request (you want some extraordinary bouquet of flowers, which is not in our catalog). Our courier service will ensure delivery the bouquet in Lugansk on time. Flowers delivery to Lugansk takes place 24 hours a day. How often do you give presents to people who get along with? Keep in touch with your friends, even if you far away from each other. Online flower shop Flowers.ua successfully works over 7 years especially for that people who love to make surprises for family and friends. Flowers delivery in Lugansk with Flowers.ua can make you closer. Choose bouquet of flowers in Lugansk added with chocolate, cake, fruits or personal card and surprise dear people in the city. Lugansk flowers delivery service is of high quality, but not expensive! High-quality bouquets in Lugansk are always fresh and beautiful. 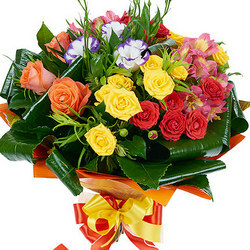 Send flowers to Lugansk is made by the fastest couriers in Ukraine! All flower bouquets, presented in the section Flowers delivery in Lugansk, as well as in other sections of our online flower shop Flowers.ua, will satisfy the most demanding costumers and refined tastes. Bouquets of flowers in Lugansk are created by professional florists in Lugansk who make them in accordance with any occasion – birthday flowers, wedding bouquets and flower arrangements. Online flower shop Flowers.ua help you order flowers to Lugansk quickly and easily. It’s would be nice to give gentle-colored flowers to a young girl, to a beautiful lady - red roses, white roses, mixed rose bouquets, a man would be appreciated with strictly vertical bouquet of flowers, a little child likes a bright and cheerful floral arrangement or a funny bouquets of sweets. Online flower shop Flowers.ua offers great choice of flowers in Lugansk and guarantees flowers delivery on time! Professional consultants and managers Flowers.ua are always ready to help you and advise right flowers that are suitable to events. Support service Flowers.ua works for you seven days a week. Ask your questions by phone, chat or email. Buying flowers in Lugansk you can use any convenient way and time. Online flower shop Flowers.ua works without days off and holidays, so you can be sure that the greeting will be done on time and in high level.